Normally, I'd be out at my local craft watering hole's Two-fiddy Tuesday, but a cold is beating me up and the DVR is filling up, so the blog wins tonight. 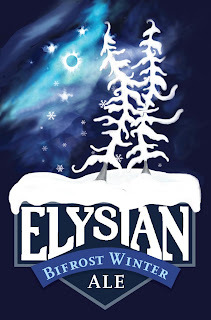 I got an e-press release from the people at Elysian with some excellent new artwork. Fine, but not special. I would never have blogged on it. 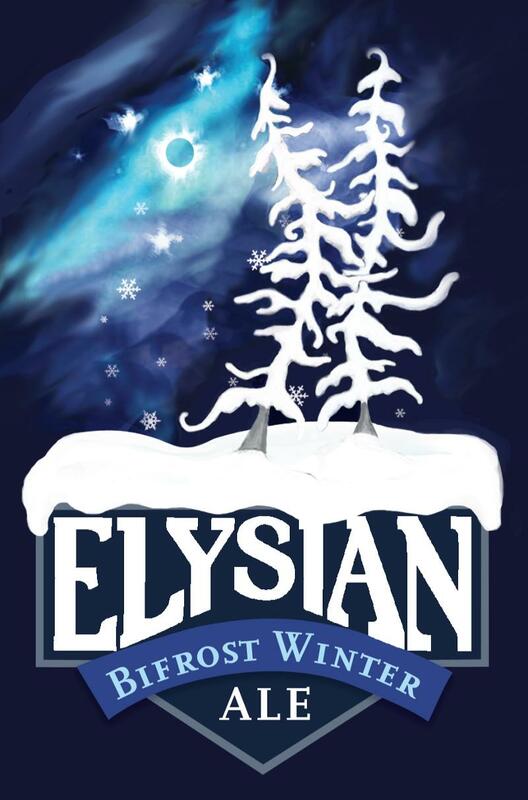 The new label loses the dilution of the light blue field around it and the yellow field with the brewery name. Instead, the whole thing is a dark, icy blue that radiates a wintry feel. It's a more elegant design, and probably cheaper to print (these things do matter, you know). Nicely done, and by now you can probably recognize tattoo-influenced art when you see it. 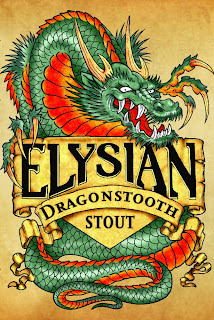 For Dragonstooth Stout, we partnered with Seattle tattooer Joe Who of Pierced Hearts Tattoo. We raise a glass to Joe for the great new design! Check out more of his ink here. Who is definitely a talented artist (insert your own Abbott and Costello joke here), and this label is excellent example of how tattoo art can translate well from skin to another small surface like a beer label. The dragon is intricate, engaging, colorful and they even used a beige background to call to mind a (Caucasian) fleshy backdrop. I've added a poll asking what type of posts you want to see. The reality is that time has kept me posting sparsely, but I think I could crank out more frequent posts if they were shorter. Problem is I'm not sure if you, the readers, want that. So if you could please vote and tell me your thoughts, I'd appreciate it. In my last post, I gave you some saltiness about established writers trashing blogs. If there's an anti-anti-blogger organization, it's Wikio, which compiles blog rankings. This particular blog is currently the 121st most influential beer blog, according to one of their rankings. That may be sad, but I've already climbed 17 spots, and anyway Andy Crouch has pushed me into the arms of the Wikio army. So I've added a little badge thing to the blog, and a little button to let yinz share the content (which apparently boosts my influence). Truthfully, I care little about rankings like this, but it's fun and I want to give Wikio the advertising because an actual human being there sent me an honest-to-gosh email asking me to. Stephen Jannise, a software writer, is running a poll about what you do when your favorite beer is out of stock. His point is that logistics software could help even out kinks in the supply chain of craft beer, which are numerous and annoying. I actually think that bars - which need to turn beer over and maintain variety - aren't the place for it, but that some of the larger craft breweries could find an advanced system helpful in forecasting demand. Of course, they may already have ERP-like systems keeping track of such things, but the ones I've seen know there's demand when their distributors yell at them for more beer, by which point it is of course too late. Anyway, go vote, especially if supply chain stuff is interesting to you. I received word that you will be making a decision on December 2 about letting the tasting room of Cigar City Brewing remain open. As someone who lives very far away from your municipality, I wanted to impress upon you a few things to consider as you make your decisions. Craft beer is a big business. Just a few numbers courtesy of the brewers association: Craft brewing is an almost $7 billion industry, providing about 100,000 jobs. In 2009 2010, it grew by double digits while the overall economy stank and overall beer sales were down more than 2%. So it's not just an issue of people liking beer; this is real money. Please realize how immense a name Cigar City is to the craft beer community. I know it's tough sometimes for us to see things that are in our backyard. As the old saying goes, no man is a seer in his own village. But CCB is a major name in the craft beer industry nationwide. I'm in Pennsylvania, and I watch eagerly for their releases, and I'm not in any way out of the norm. Craft beer in Florida generally stinks. It's got a lousy reputation in the rest of the country as far as craft beer goes, with a few notable exceptions. The most notable of these, in my humble opinion as a beer geek, is Cigar City. Craft beer people travel. We really do. We go all over the place to see breweries, taste beer, and get the culture that produced it. Your own state features a blog dedicated to such trips, http://www.roadtripsforbeer.com/. Silly? Maybe, in the sense that all hobbies are a little silly, but it brings us some joy and, more importantly for you, we are willing to spend money on it. The next time I go to Florida, I will likely make a stop in Tampa, and it has nothing to do with the rich cultural history of the city (which I'm sure I'll enjoy once I'm there), it will be to visit the best craft brewery in the state and arguably one of the hottest in the country, Cigar City. At least, I will as long as there's something to visit. This is a big thing for Tampa. Of course, there are bigger things, both financially and culturally. The Bucs are bigger to the city, I'm sure, as is the aforementioned cultural heritage. But in our humble, $7 billion community, Cigar City is big. They're a fast riser in a high-end, high-spending, intellectual and travel-heavy niche. They produce interesting, exciting, quality products and do it from a state that was previously an afterthought for many in the craft beer scene. And they do it all by embracing Tampa. 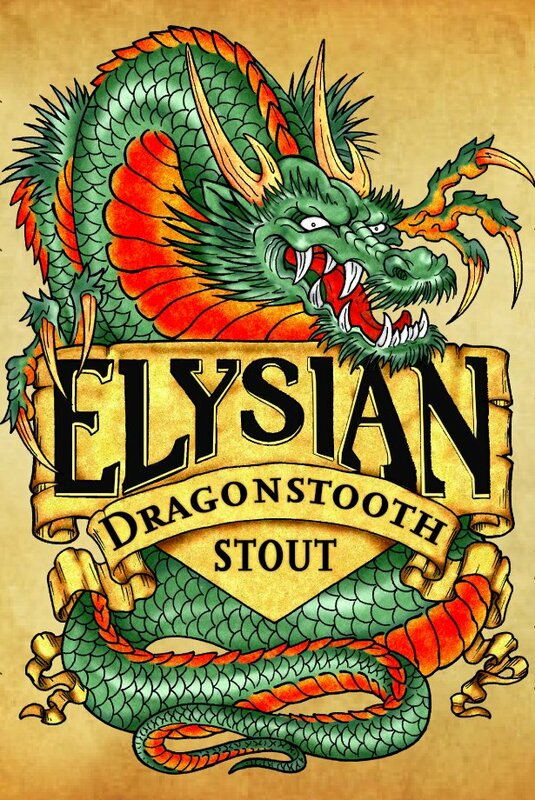 Their name, their design, their beer names... everything about the brewery screams pride in the community. When a lesser company might have decided to shy away from a place that was previously not much of a beer destination, Cigar City decided to highlight their location and love of the City of Tampa. I can totally understand that a council like yours has tough decisions to make. Sometimes, you have to be in the unenviable position of enforcing rules people don't like for the greater good. But my understanding is that the tasting room at Cigar City has an exemplary record of safety and behavior, and, really, I just can't understand why anyone wouldn't want to help businesses like this. I work in a small city in PA, and trust me, our civic and community leaders would be thrilled to have thriving, nationally respected small businesses that made a point of celebrating our area's history and heritage. You've got something great in your city, and I'm looking forward to visiting it. For those of you who voted to keep the tasting room open, thanks for protecting it, and if you're considering voting to close it, well, thank you for at least taking a moment to listen to the thoughts of a prospective Tampa beer tourist. Just stumbled on this post. Thanks for the support of Cigar City, truly something us beer geeks in Florida can be proud of, and also thanks for the shoutout to Road Trips for Beer in the letter. A New Mess of Links, With ART!